Colors: InfinityEvening Chic IICountry CatHearts 'n RosesAmazon This item is currently out of stock! Your cat will love hanging out in the SnoozePal Cat Hammock. 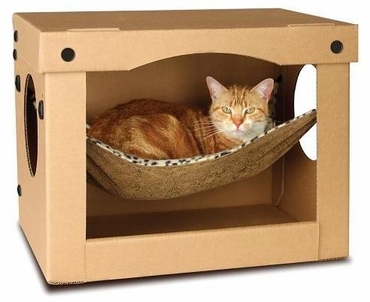 The SnoozePal™ sturdy cardboard box encloses a comfortable hammock to snuggle in, gives your cat an elevated spot off the floor, and has porthole windows to keep an eye on everything. A happy cat is a cat in a SnoozePal cat hammock. SnoozePal™ cat hammock with reinforced roof! Your cat can lounge in the hammock or sit on top. The SnoozePal™ box is recyclable. *Flat shipping rate of $15.75 via US Postal Service now available for SnoozePal. Please see at checkout. *Wilmington, NC shoppers can arrange for pick up. Please indicate "Pick UP" at checkout. Please indicate your choice of sling color/pattern in the Colors box above. If you'd also like to purchase an extra hammock sling, please go to Replacement Hammock Slings. My cats love the SnoozePal Cat Hammock-in-a-Box. Sometimes there will be one cat in the hammock and one sleeping on top of the box. I would recommend it to any cat owner. The boys love it - happy brothers! Wonderful hangout/clearly very comfy - many thanks! I have 3 babies, and they all LOVE the SnoozePal cat hammock!! Not only do they love sleeping on the hammock itself, but the top of the box provides another lounging surface. I'm extremely happy with this purchase, and have recommended to others. The Cat Hammock-in-a-Box is brilliant – giving cats a sense of "enclosed" security while snoozing but open enough to be able to observe and escape if necessary. My two cats have already established their favorites: Your original hammock is Puma's territory and the box hammock belongs to MacDuff (with Puma crouched on top for intimidation purposes). The designs of both hammocks are so very original and "green." They are a pleasure to look at, not to mention the comfort/play areas they provide my monsters. Kate, my manx cat, loves the cat hammock-in-a-box! She got in it right away after it was assembled and makes frequent visits now. Sometimes, depending on her mood, she hangs out under the hammock and all I can see are her two glowing eyes. Two of my three cats love the SnoozePal. The third is still suspicious, but he is willing to roll around in the box underneath the hammock. One has totally claimed the hammock as his, and even if he's not interested in lying in it at the moment, he's willing to defend it should he find anyone in there sleeping. All four of my cats love the SnoozePal cat hammock. I also have the original wood-frame one, but my oldest took it over and the others always wanted to use it. When I saw you came out with the SnoozePal I had to get it so the other cats could have a hammock too. They use it all the time and even chase each other out of it so they can have it. Both of the hammocks have become a favorite spot of all my cats, but especially my oldest, Ty. They are one of the most comfortable places for him to sleep due to his arthritis. We got the SnoozePal Cat Hammock for our young adult cat, Abby. She hasn’t done any snoozing in there yet, but she loves the vantage point the SnoozePal offers for keeping up with the goings-on of the rest of the household. My two cats absolutely love their cat hammock! The second I read about it on ModernCat I knew that they would....hammock in a box? Those are their two favorite things combined into one. Ingenious! Both sat and watched with great interest as it was put together, and then Purrington immediately climbed in and settled into the hammock while Meowington got comfortable up top. Since then, they seem to take turns curled up in it every day, which is very nice of them to be sharing so wonderfully. Purrington's a cardboard chomper, and it's great that the box's cardboard is so hefty and sturdy. He put a few marks in it initially, but nothing that makes me worry that he may one day compromise the structure and integrity of the box if he tries to chew on it anymore. Great product! My cats give an enthusiastic four paws up! I was surprised with how sturdy the SnoozePal box actually is. I wasn't TOTALLY sold on it, kind of wondering if it would be quite strong enough to deal with our girls' rough use. Remarkably, so far so good. Our two oldest kitties love it. Pooka, at 16 pounds, had no trouble getting in and out, and, more importantly, there was no sign of strain on the part of the SnoozePal.